Simple. Healthy. Kids will eat it. CHECK!! You know me, if it's simple and in the crockpot I'm in. 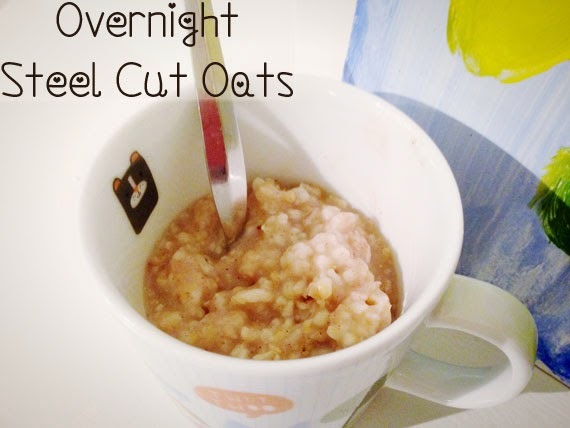 As you know from my overnight oatmeal post we are oatmeal eaters. While we usually do the refrigerator oats sometimes I like to mix it up! This is done overnight in the crockpot and you wake up to hot, steamy [healthy] breakfast. We always have leftovers that I put in the 'fridge for the next day. Two days of breakfast in one shot! The recipe is to be cooked in a crockpot for eight hours on low but, if you go to sleep early you certainly don't want to get up at midnight to get your breakfast ready for eight. I've been making this recipe for about a year but it took me a while to figure out how to get around that. For a while I was making sure that I got up to turn the crockpot on but it was getting annoying! I got a Crockpot that does NOT have auto shutoff. It needs to have a knob that (hand-me-down from Mandi) that turns to off, low and high. I set it to low. Then I got one of those light timers that will turn your lights on and off automatically. I plugged the crockpot into that and set it to be on from midnight to eight am. Put all the ingredients into the slow cooker and cook on low for eight hours.